Nissan tried to fix this problem two years ago, but apparently, it didn't work. Recalls happen. We accept that as a fact of life in the automotive industry. We just expect that once the recall's taken place, the issue will be fixed. But that's not the case with this latest from Nissan. 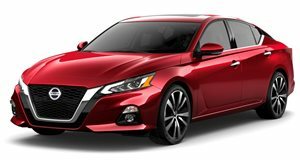 A couple of years ago, the Japanese automaker issued a recall notice for 341,005 examples of the 2015-17 Altima. Now it's issued the same recall again for the same issue affecting 341,003 vehicles. So apparently, either the problem was only actually rectified on two vehicles, or there are two fewer affected than Nissan originally thought. Either way, the problem's the same: the rear doors could open unexpectedly, which could be bad news – especially if the vehicle's in motion, and you have kids riding in the back seat. The trouble apparently comes down to the cable that's supposed to latch and lock the door in place. According to the National Highway Traffic Safety Administration, that cable may not have been routed properly, so if the window's lowered, the door could open. How Nissan could have recalled those vehicles to address precisely that issue but not have properly fixed it, we don't know. But hopefully it'll rectify the problem this time. The issue is limited to Altima sedans from the 2015-2017 model years, manufactured between September 17, 2015, and October 6, 2016. That amounts to barely more than a third of the nearly 900,000 Altimas sold in those three years (bearing in mind that model and calendar years are not the same). Of those being recalled, only 0.41 percent are estimated to carry the defect. But dealers will have to check them all out to be sure this time. And because of the potential consequences of those rear doors opening, a stop-sale order has been issued for any vehicles that may still be on dealer lots.